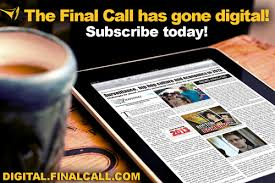 TEHRAN, Iran and DOHA, Qatar—Nation of Islam Minister Louis Farrakhan’s name was splashed across TV screens, Twitter feeds, newspaper pages, internet news searches and spewed out of the mouths of journalists. Mischief media was again at work as American, British and Jewish outlets, in particular, repeated a bold lie that the Minister led anti-American chants while visiting the Islamic republic on the eve of and at the beginning of U.S. sanctions imposed by the Trump administration. While the misreporting captured Western media attention, the visit to Iran was much more than that and included a historic and important meeting between Min. Farrakhan and Iran’s Supreme Leader, Ayatollah Ali Khamenei, who is the highest ranking official in the country and serves a lifetime term of office. The Minister also held important meetings with major political and religious leaders, students and the media. “I never led a chant that called for the death of America or Israel, contrary to misreporting in U.S., British and Jewish publications and the intentional, malicious and false reinterpretation of my words,” said the Minister in a statement issued from Tehran. Iranian journalist Nader Talebzadeh who has interviewed the Minister in the past (left) and translator that translated Min. Far- rakhan’s remarks in Farsi (right) at Tehran University in Tehran, Iran. “There is nothing more important than truth today. The truth of anyone and anything is enough to condemn any individual or institution. But to make media mischief by altering my words from their places is a betrayal of the right to free speech, the blessing of a free press and a violation of the people’s right to know. It is wrong and shameful that journalists and news organizations that should seek the truth would traffic in such lies. “I never led a chant calling for death to America. To say otherwise is a blatant falsehood and an attempt to paint me as an enemy in a very dangerous time as tension rises between America and Iran and nations around the earth reject unjust sanctions and heavy-handed U.S. foreign policy,” he continued. 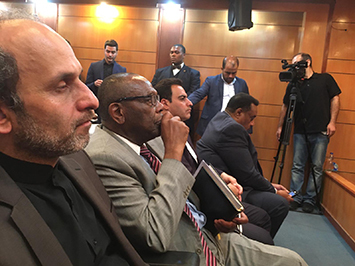 The Minister’s points of correction followed an address to law students at Tehran University, where the room was packed. He spoke as the president re-imposed trade, finance and other punishments on Iran. The Trump administration Nov. 2 restored U.S. sanctions on Iran that had been lifted under the 2015 nuclear deal, but carved out exemptions for eight countries that can still import oil from the Islamic Republic without penalty. The sanctions took effect Nov. 5 and cover Iran’s shipping, financial and energy sectors. They are the second batch the administration has re-imposed since Mr. Trump withdrew from the landmark accord in May. Mr. Trump repeatedly denounced the agreement as the “worst ever” negotiated by the United States and said it gave Iran too much in return for too little. But proponents as well as the other parties to the deal—Britain, China, France, Germany, Russia and the European Union—vehemently defended it. The Europeans mounted a drive to save the agreement without the U.S., fearing that the new sanctions will drive Iran to pull out and resume all of its nuclear work. Secretary of State Mike Pompeo said Iran must meet a list of 12 demands to get the sanctions lifted that include an end to its support for terrorism and military engagement in Syria and a halt to nuclear and ballistic missile development. Mr. Pompeo said eight nations will receive temporary waivers allowing them to continue to import Iranian petroleum products as they move to end such imports entirely. He said those countries, which other officials said would include U.S. allies such as Turkey, Italy, India, Japan and South Korea, had made efforts to eliminate their imports but could not complete the task by Nov. 5, the day sanctions became effective. Mr. Pompeo defended the oil waivers and noted that since May, when the U.S. began to press countries to stop buying Iranian oil, Iran’s exports had dropped by more than 1 million barrels per day. Some Iran hawks in Congress and elsewhere said the move should have gone even further. They were hoping for Iran to be disconnected from the main international financial messaging network known as SWIFT. With limited exceptions, the re-imposed U.S. sanctions hit Iran as well as countries that do not stop importing Iranian oil and foreign firms that do business with blacklisted Iranian entities, including its central bank, a number of private financial institutions, and state-run port and shipping firms, as well as hundreds of individual Iranian officials. Treasury Secretary Steven Mnuchin said 700 more Iranian companies and people would be added to the sanctions rolls. Those, he said, would include more than 300 that had not been included under previous sanctions. Israel, which considers Iran an existential threat and opposed the deal from the beginning, welcomed the announcement. The sanctions drew widespread protests in Iran and coincided with the anniversary of the 1979 takeover of the American embassy that was a major part of the student-led revolution, and a holiday devoted to Islamic martyrs. The annual commemorations draw Iranians out of their homes and into the streets. Sanctions appeared to increase the spirit of resistance and numbers of people participating. The demonization of Min. Farrakhan and any Black leader who speaks about or criticizes U.S. foreign policy has been a mainstay in American history and includes such figures as Paul Robeson and W.E.B. DuBois, Dr. Martin Luther King, and the Rev. Jesse Jackson. The aim is to keep voices of Black dissent from affecting what the U.S. wants to do abroad, explained Eugene Puryear of the Answer Coalition, which is opposed to war and racism. 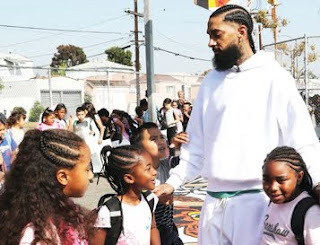 “I think that sort of demonization is important because Minister Farrakhan has stature in the Black community, and not only stature as an individual. But (he) is the representative of an organization that has a long deep history in the United States, in general, but certainly in the Black community. And in a time where you want to have full-on demonization towards Iran and you don’t want anything to crop up where there are likely points of opposition,” he continued. The Black anti-war activist is based in Washington, D.C.
“If someone just says, ‘Oh Minister Farrakhan was over in Iran I wonder what that was about. Let me look more into this.’ That is potentially dangerous because if you really scratch the surface I think many people who aren’t paying attention will see on multiple levels that these sanctions are terrible, that the policy is really only going to hurt the most average people,” Mr. Puryear said. Most people see such policies have not worked in Iraq, Libya, Syria, and Yemen, noted Mr. Puryear. “So perhaps the same sort of policies on Iran might not actually be good and might not work and maybe we need to rethink how the U.S. engages in that area,” he said. Questions about Iran policy may also dovetail with questions about policy toward the Palestinians and U.S. policy that sides with Israel, Mr. Puryear continued. “So what does it mean to have a situation, sort of a spiraling domestic opposition? I think you want to demonize any voice who by engaging with Iran can provide a bridge to a significant number of people,” he said. 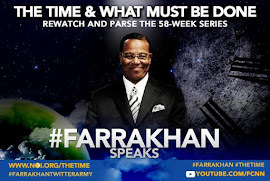 “And I think as much as many people do not like this, the reality is that Minister Farrakhan is someone who people pay attention to; want to know what he has to say and who can redirect the conversation at least in terms of people paying attention to him and that’s certainly not what they want. I think they want it all negative all the time. And, I think in the past that is also the case and, in particular, rebelliousness in the Black community is never looked upon fondly,” Mr. Puryear said. Leonard F. Muhammad, a longtime advisor and aide to Min. Farrakhan, made the trip to Iran. He argued all American ethnic groups draw a distinction about what is good for their home country versus what is proposed under U.S. foreign policy. “When I look at our foreign policy in Africa, our foreign policy in the Middle East, and Central and South America, I realize that our government’s position and what they feel is in the interest of America may be totally different from positions that Black people ought to take,” he said. “It’s a big mistake for Black leaders and other leaders to remain silent depending upon what color the country is that is being mistreated, that is being disaffected and starved, and millions of people of whose lives are being hampered by these sanctions. We saw it with Cuba. We saw it with Libya. Oddly enough, for the most part, it’s been all non-White nations that are primary targets for sanctions,” Leonard Muhammad observed. In talks with students, political and religious leaders as well as journalists, Min. Farrakhan consistently stated the sanctions were wrong and called on Iran to find a way to talk to rival Saudi Arabia, a U.S. ally and proxy. Tensions between the two nations, predominately Sunni Islam Saudi Arabia and predominantly Shia Iran, have been high. The Minister warned the two regional powers must find a way to mediate their problems and open lines of dialogue, otherwise the door will be opened for U.S. intervention and war. While the mainstream media tried to paint the Minister in an ugly, unpatriotic light, his purpose, position and his focus were clear. “I am not and have never been an enemy to America, nor the people of America. However, I love America enough to speak unpleasant truths that are in the best interests of an erring nation that perhaps she may change her conduct and course. I have an abiding love for the right to free speech, the right to a free press and the right every human being has to hear the truth. It is only truth spoken in season that can bring us what we desire of freedom, justice, equality and, ultimately, peace,” he said in his Nov. 8 statement. 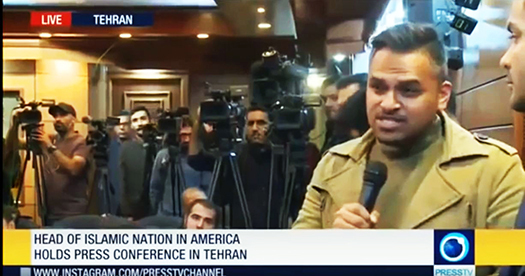 During a news media conference at Press TV, the English language station for Iran that offers news and programming, an Iranian journalist tried to bait the Minister into an anti-American chant. The Minister refused. “So, the Western media outlets, especially the United States media outlets are accusing you these days of leading death to the United States. I just read a couple news items about you and how the Western media is accusing you of chanting the ‘Death to the United States.’ I want to ask you this question: Would you, are you willing to chant the slogan of ‘Death to the United States?’” asked the questioner. “No, I will not do that. I will not do that,” the Minister responded sternly and bluntly. “I would ask who sent you to ask that question? You see, you seem to be one of those who are paid at PressTV to provoke that. That’s not my chant,” declared the Minister in a strong voice. There was tension as the reporter tried to add to his statement, but Min. Farrakhan would not accept that. Reporter tries to bait Min. Farrakhan into reciting anti-American chant. The Minister refused. “I heard you,” said Min Farrakhan. “I heard you. But I also heard something else about you that I don’t like. You want me to chant because they lied on me and said I led a chant. I know that chant came from the people of Iran and this sanction is what’s hurting the people of Iran. They have a right to chant it, but I’m not a chanter! I’m a worker for God and the truth will undo falsehood and the righteous will win against the wicked! Not with a chant, but with actual words and deeds. I just don’t, I don’t like your attitude,” he said. “You know, I have to say this: I’m not just listening to your questions. God is showing me your motives. And I’m addressing with anger, your motive. I know the question. I don’t like it. Now, I’ll take one or two more questions but if you got—if you have not heard me yet, then I’m wasting my time. Is there another question?” he asked. While some mainstream outlets focused mainly on the false chant charges and others focused on his anti-sanctions positions, Iranians embraced the Minister and his expansive messages about creating Islamic dialogue, national development and unity, respect for women and greater understanding of young people, the value of Islam and the Holy Qur’an in resolving disputes. They listened carefully to his assertion that the Great Mahdi, the self-guided one the Islamic world is looking for, made His appearance in North America in 1930 and started the Nation of Islam movement. Min. 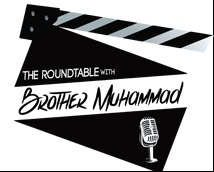 Farrakhan boldly declared and laid out an explanation of the Mahdi’s advent in America and his declaration that the Mahdi had raised the Hon. Elijah Muhammad, patriarch of the Nation of Islam, to the prophetic position of Messiah. Iranians from all walks of life and levels of society listened intently during meetings and during sessions that were broadcast via television. “The Minister went there with a very definite purpose to provide some information and a warning to the Iranian government, and I was blessed to witness him carry that out faithfully. And I was also blessed to see the reactions from the Iranian citizens and the Iranian government to what the Minister had to say while he was there,” said Leonard Muhammad. Abdul Akbar Muhammad (center), international representative for Min. Farrakhan listens intently during press conference. 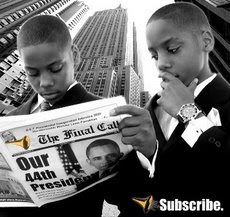 “He spoke with absolute authority and that authority that we know as given to him by the two that back him up: Master Fard Muhammad as well as the Most Honorable Elijah Muhammad. I thought the reception of what he had to say was excellent, both from the government side as well as the general population as they witnessed the different public appearances that he had which were televised to the Iranian people,” he added. 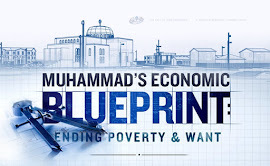 It proved that the words of the Honorable Elijah Muhammad saying Allah (God) has gone around the world making friends for his Minister were true, said Leonard Muhammad. 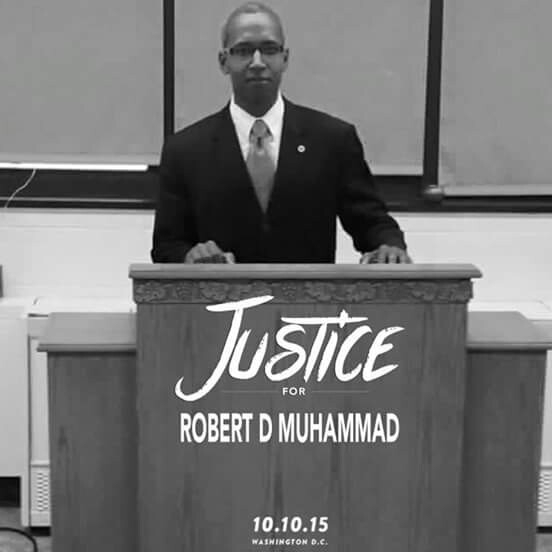 “We witnessed a great friendship unfolding in Iran with the Minister and on behalf of the Nation of Islam,” he said.